— The Natural Earth II is a new pseudocylindrical projection with a highly rounded shape. At high latitudes the meridians bend steeply inward to short pole lines. Compared to other rounded projections, such as the Aitoff and Mollweide (…), the Natural Earth II bulges out less on the sides, filling more of the printed page with your map. 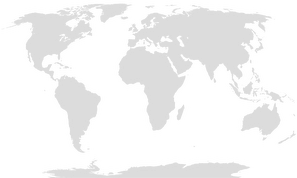 Continents look familar without the north-south streching found on the Eckert IV. The Natural Earth II has areal distortion values similar to those of the popular Robinson and Winkel Tripel projections. Nicht zu verwechseln mit dem Natural Earth II Kartenbild (ebenfalls Tom Patterson), welches hier auf der Website für fast alle Projektionen verwendet wird. Als Natural Earth II vorgestellt wurde, haben die Urheber ebenfalls diese Paarung gezeigt.